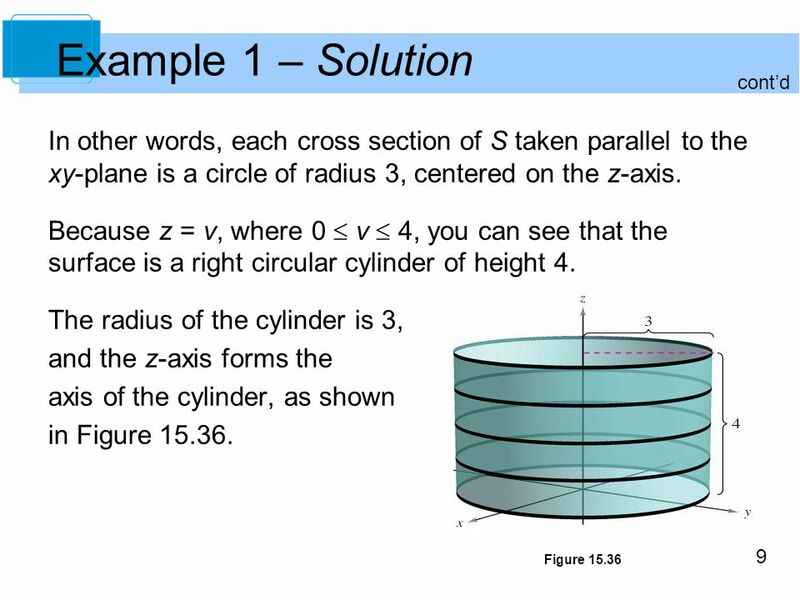 1 Copyright © Cengage Learning. All rights reserved. 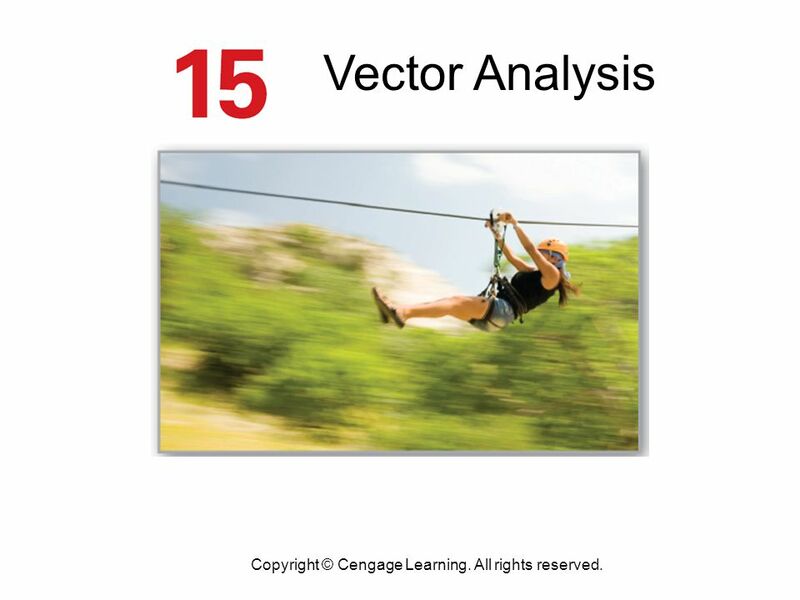 Vector Analysis Copyright © Cengage Learning. All rights reserved. 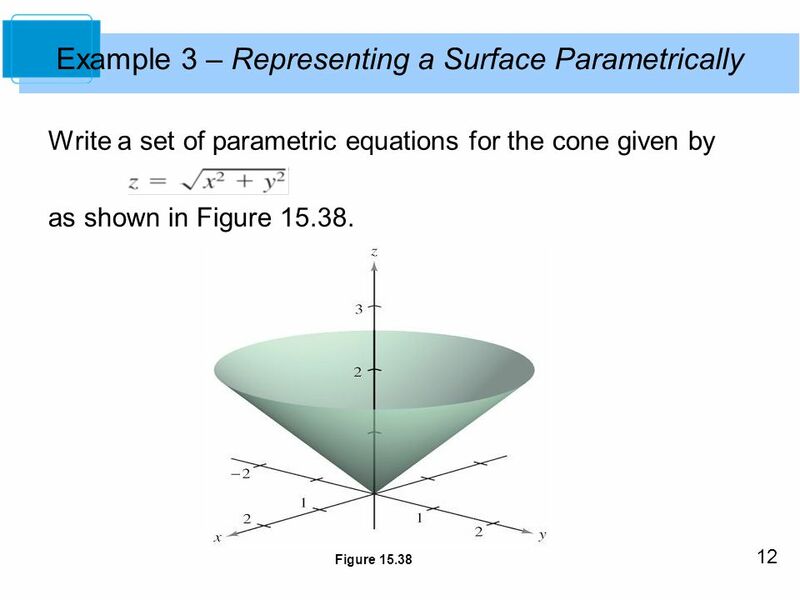 2 Copyright © Cengage Learning. All rights reserved. 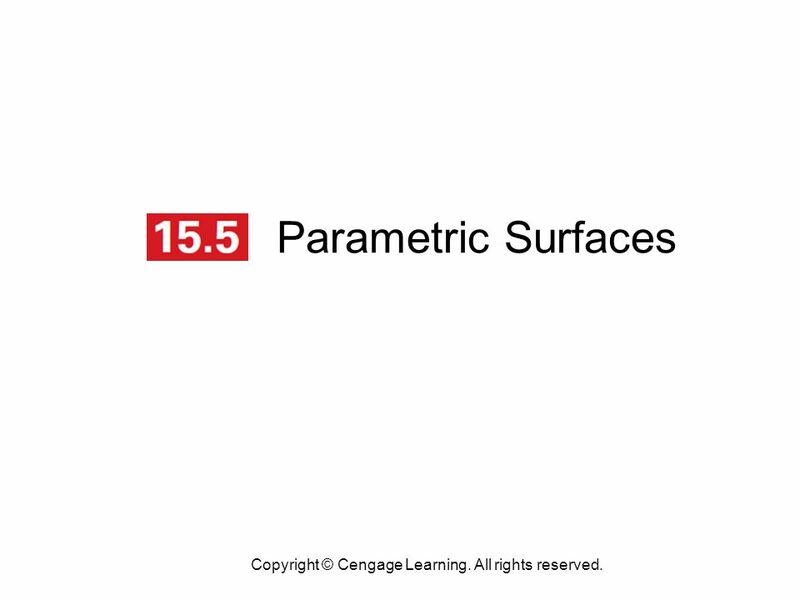 Parametric Surfaces Copyright © Cengage Learning. All rights reserved. 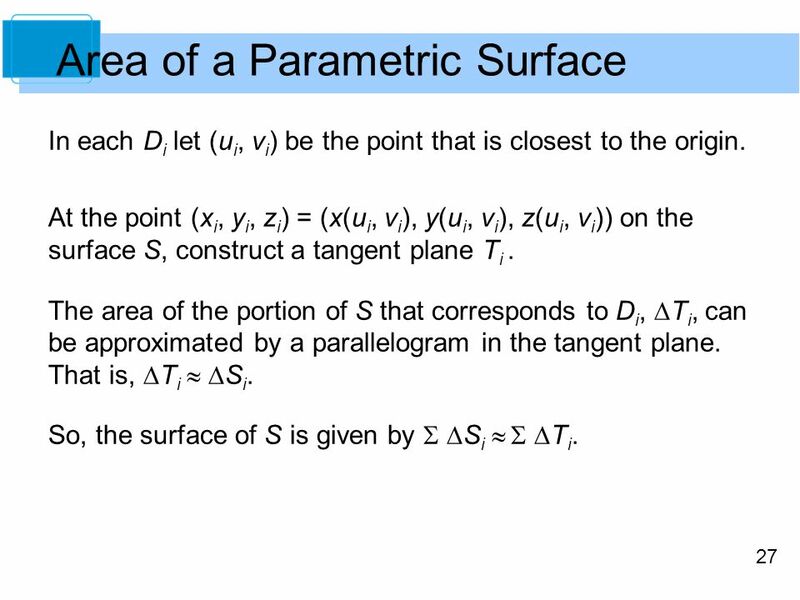 3 Objectives Understand the definition of a parametric surface, and sketch the surface. 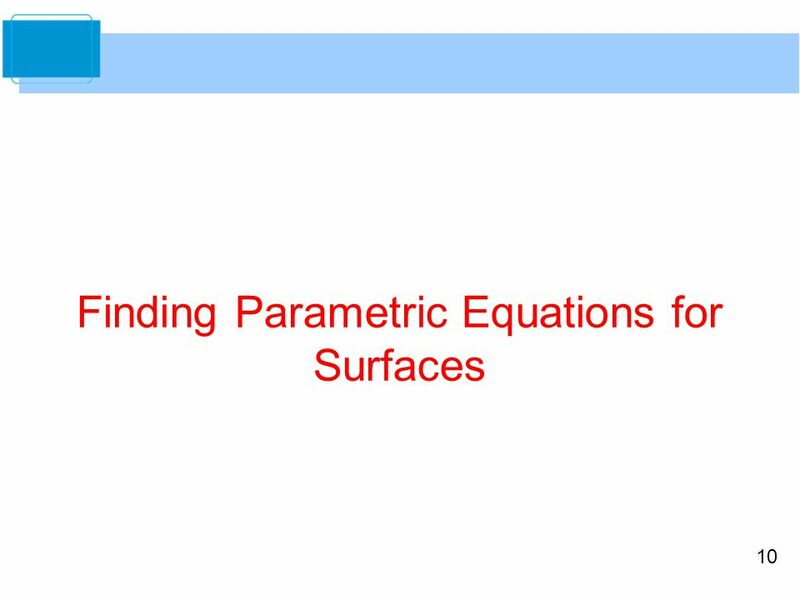 Find a set of parametric equations to represent a surface. 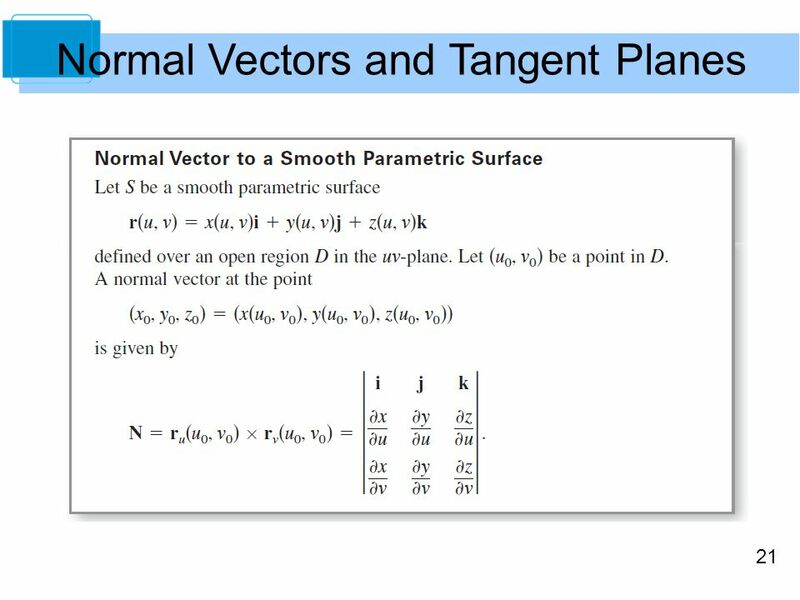 Find a normal vector and a tangent plane to a parametric surface. 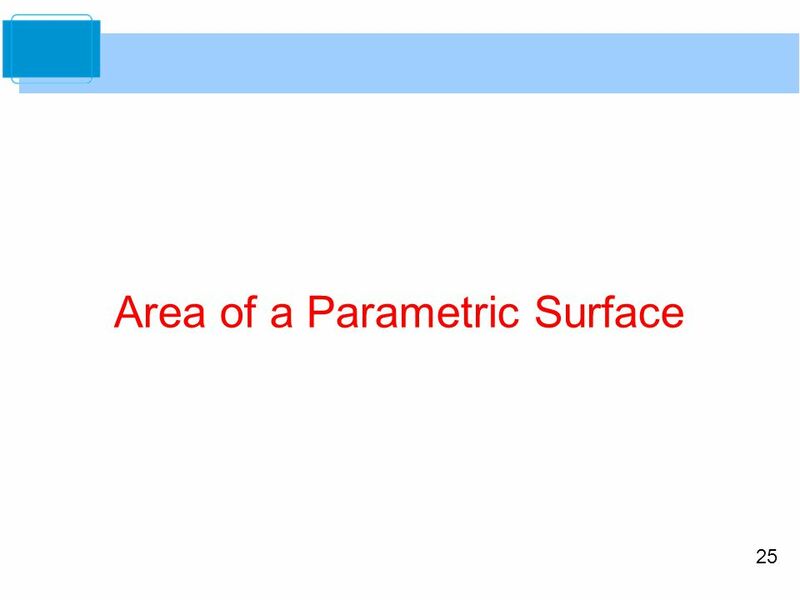 Find the area of a parametric surface. 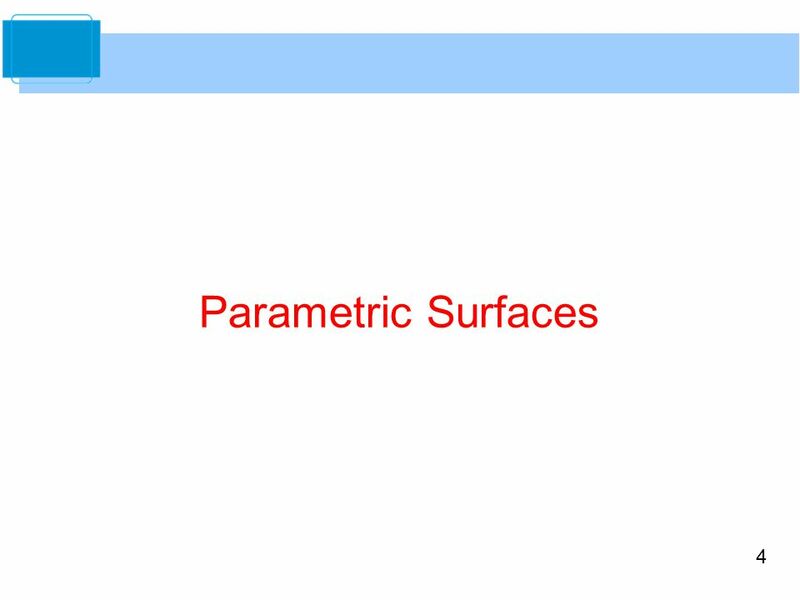 5 Parametric Surfaces You already know how to represent a curve in the plane or in space by a set of parametric equations—or, equivalently, by a vector-valued function. 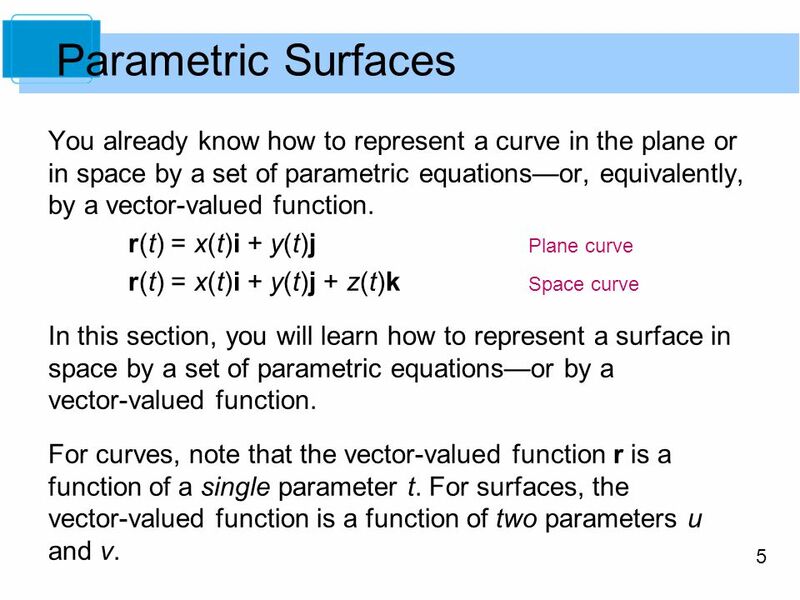 r(t) = x(t)i + y(t)j	Plane curve r(t) = x(t)i + y(t)j + z(t)k	Space curve In this section, you will learn how to represent a surface in space by a set of parametric equations—or by a vector-valued function. 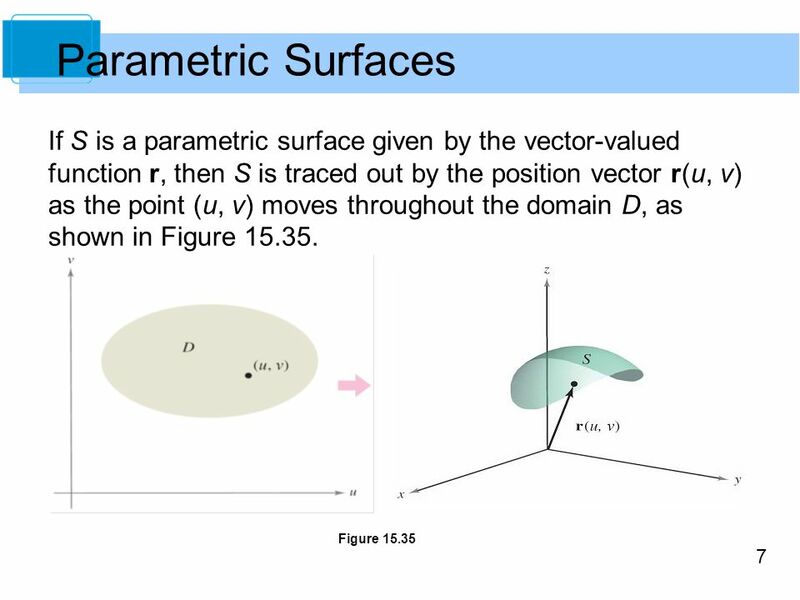 For curves, note that the vector-valued function r is a function of a single parameter t. For surfaces, the vector-valued function is a function of two parameters u and v.
Identify and sketch the parametric surface S given by r(u, v) = 3 cos ui + 3 sin uj + vk where 0  u  2 and 0  v  4. 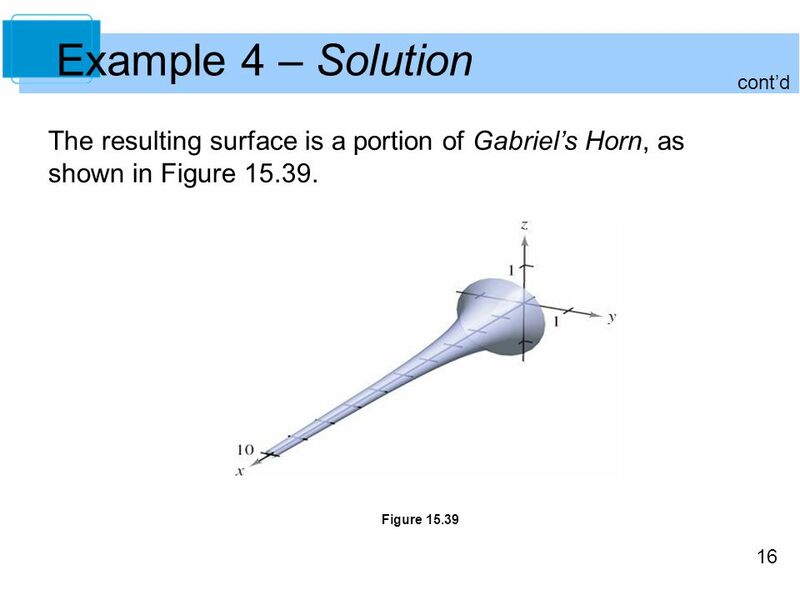 Solution: Because x = 3 cos u and y = 3 sin u, you know that for each point (x, y, z) on the surface, x and y are related by the equation x2 + y2 = 32. 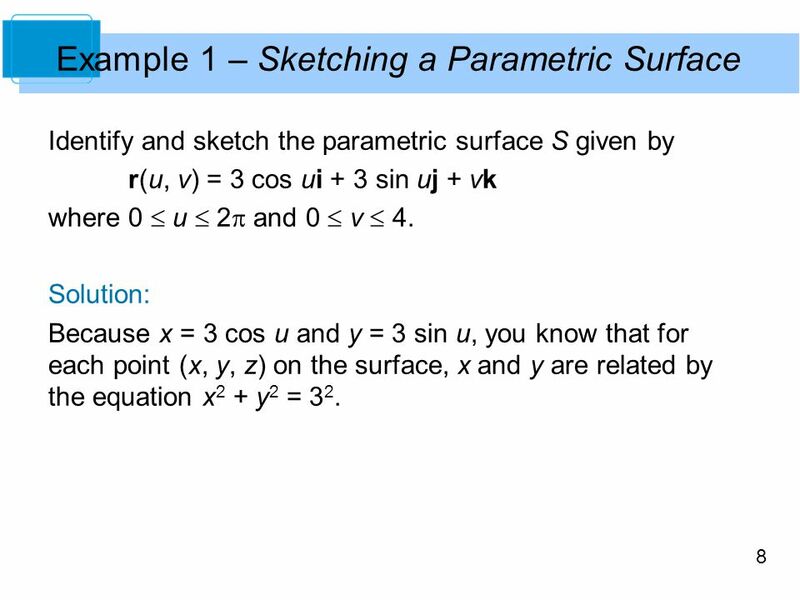 In Example 1, you were asked to identify the surface described by a given set of parametric equations. 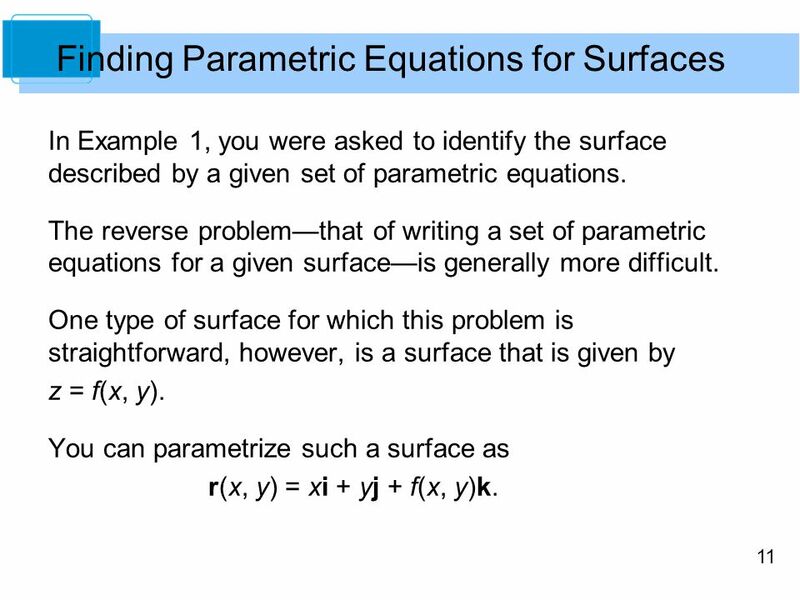 The reverse problem—that of writing a set of parametric equations for a given surface—is generally more difficult. 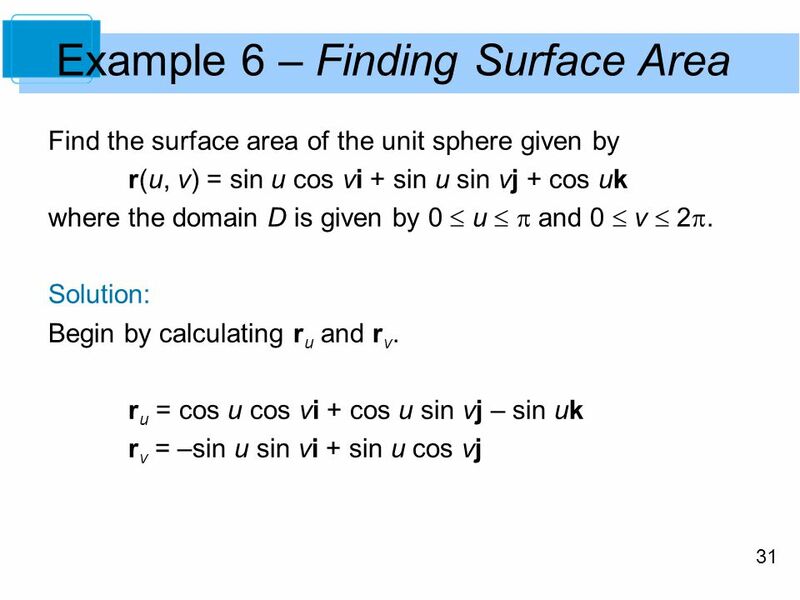 One type of surface for which this problem is straightforward, however, is a surface that is given by z = f(x, y). 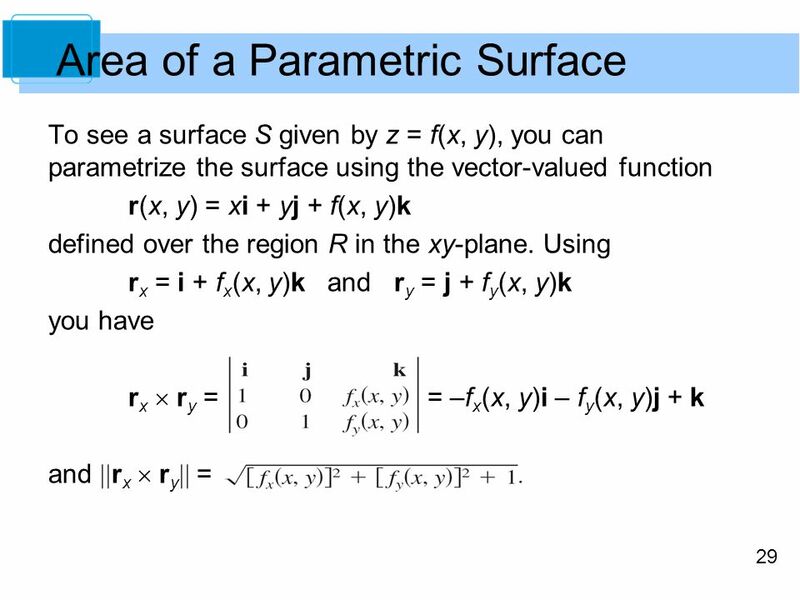 You can parametrize such a surface as r(x, y) = xi + yj + f(x, y)k.
13 Example 3 – Solution Because this surface is given in the form z = f(x, y), you can let x and y be the parameters. 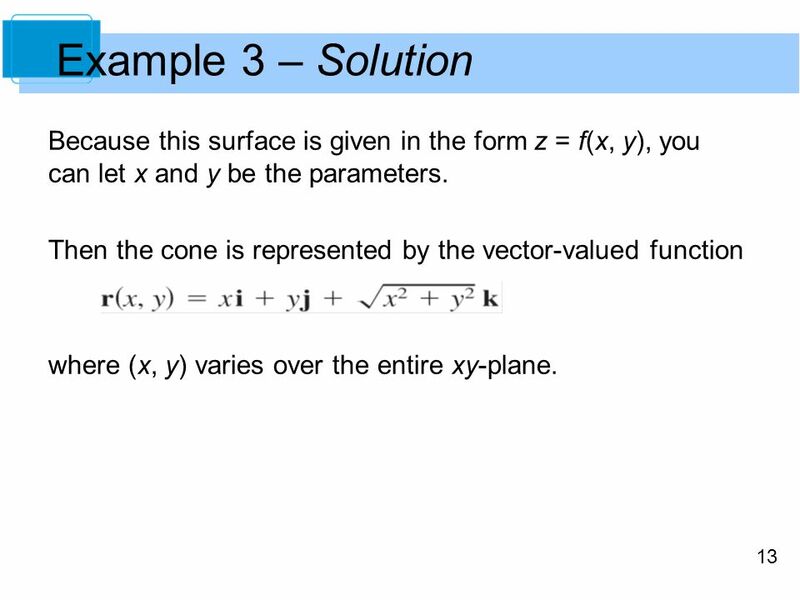 Then the cone is represented by the vector-valued function where (x, y) varies over the entire xy-plane. 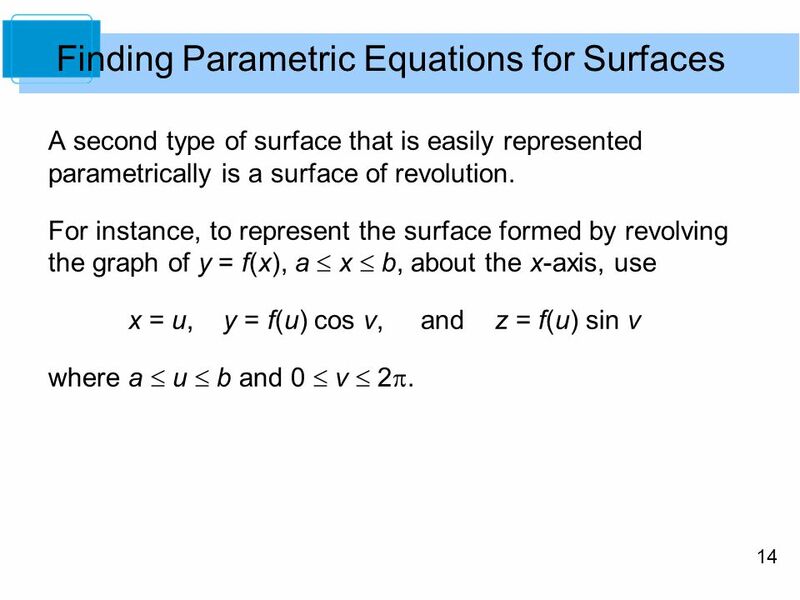 A second type of surface that is easily represented parametrically is a surface of revolution. 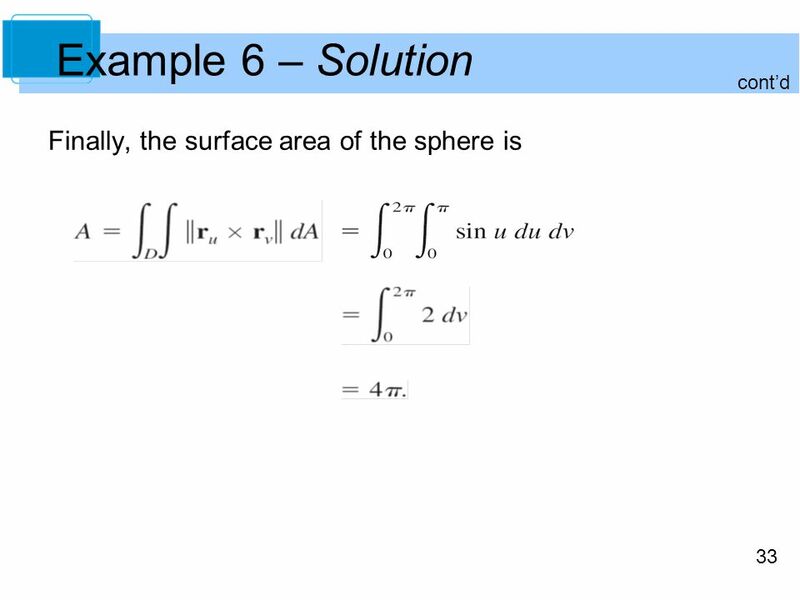 For instance, to represent the surface formed by revolving the graph of y = f(x), a  x  b, about the x-axis, use x = u, y = f(u) cos v, and z = f(u) sin v where a  u  b and 0  v  2. 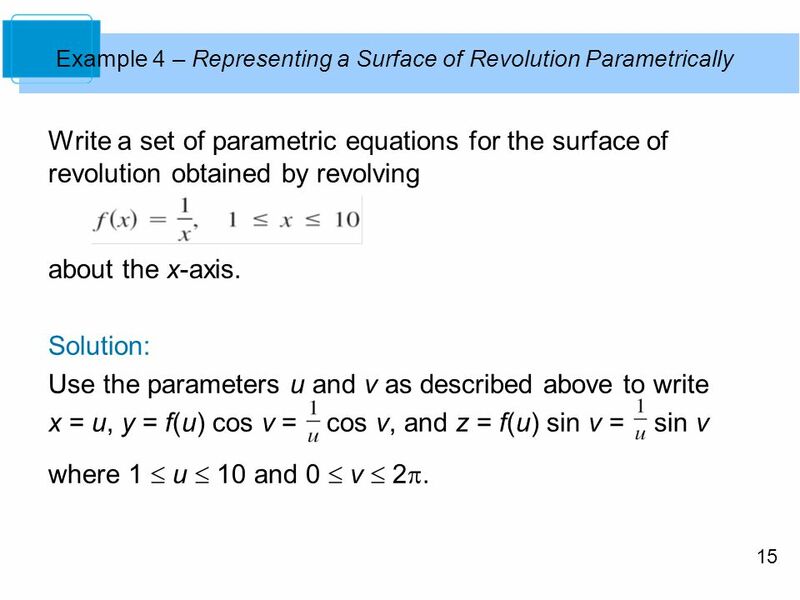 Example 4 – Representing a Surface of Revolution Parametrically Write a set of parametric equations for the surface of revolution obtained by revolving about the x-axis. 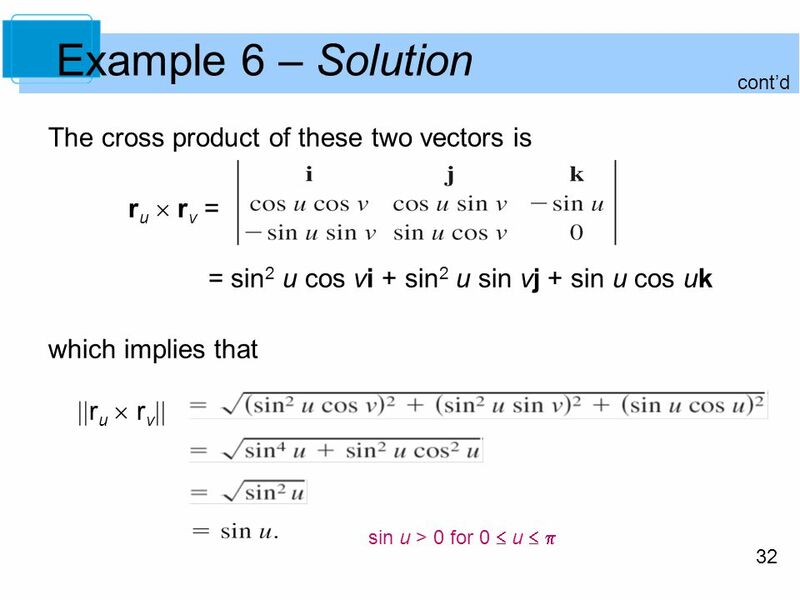 Solution: Use the parameters u and v as described above to write x = u, y = f(u) cos v = cos v, and z = f(u) sin v = sin v where 1  u  10 and 0  v  2. 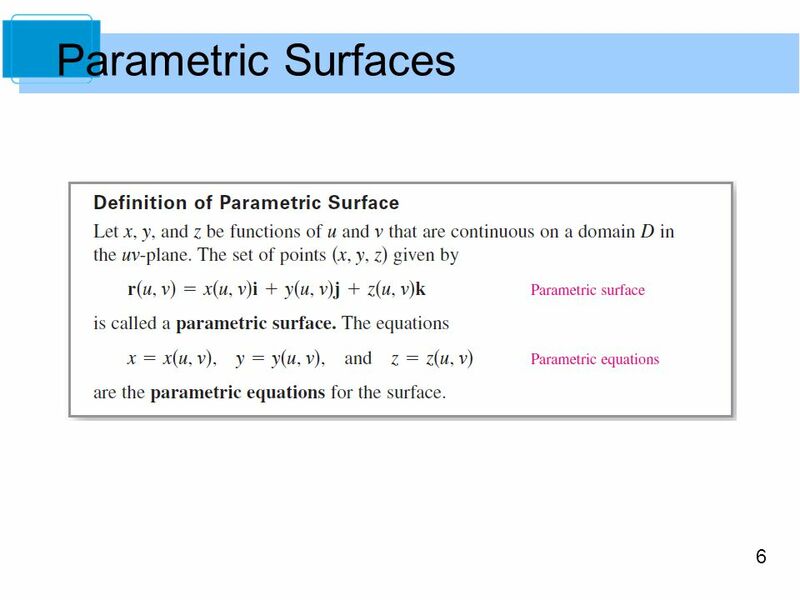 Let S be a parametric surface given by r(u, v) = x(u, v)i + y(u, v)j + z(u, v)k over an open region D such that x, y, and z have continuous partial derivatives on D. The partial derivatives of r with respect to u and v are defined as and Each of these partial derivatives is a vector-valued function that can be interpreted geometrically in terms of tangent vectors. 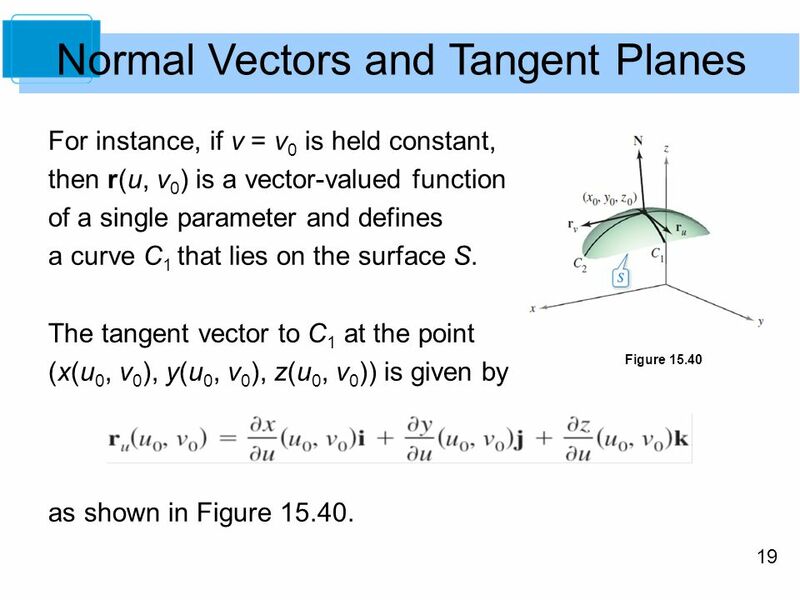 In a similar way, if u = u0 is held constant, then r(u0, v) is a vector-valued function of a single parameter and defines a curve C2 that lies on the surface S. The tangent vector to C2 at the point (x(u0, v0), y(u0, v0), z(u0, v0)) is given by If the normal vector ru  rv is not 0 for any (u, v) in D, the surface S is called smooth and will have a tangent plane. 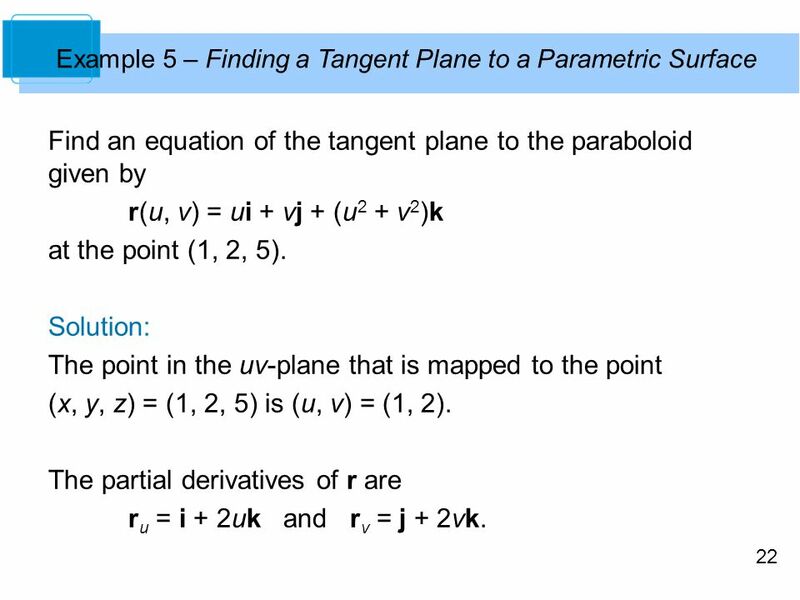 Example 5 – Finding a Tangent Plane to a Parametric Surface Find an equation of the tangent plane to the paraboloid given by r(u, v) = ui + vj + (u2 + v2)k at the point (1, 2, 5). 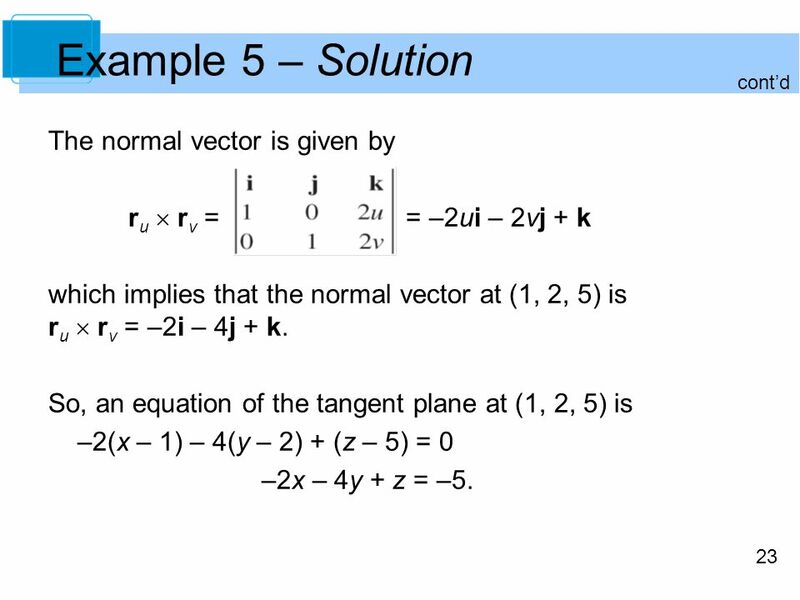 Solution: The point in the uv-plane that is mapped to the point (x, y, z) = (1, 2, 5) is (u, v) = (1, 2). 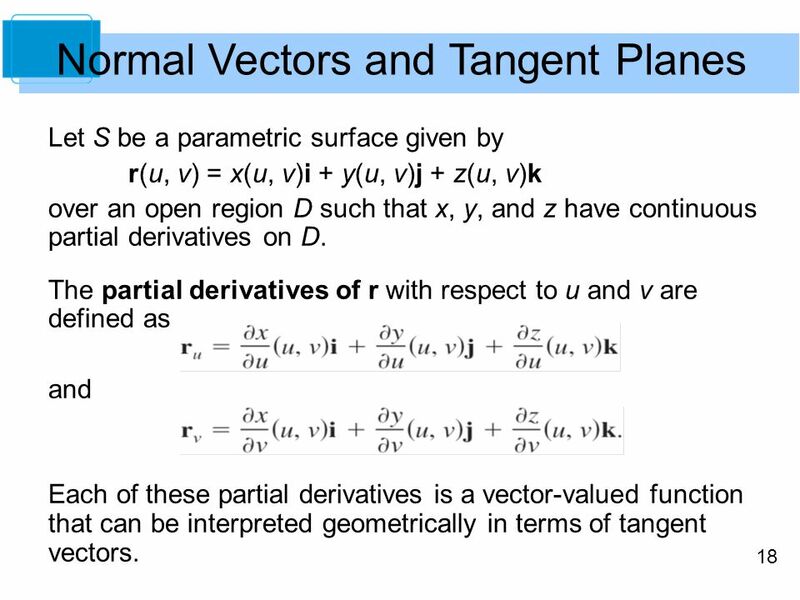 The partial derivatives of r are ru = i + 2uk and rv = j + 2vk. 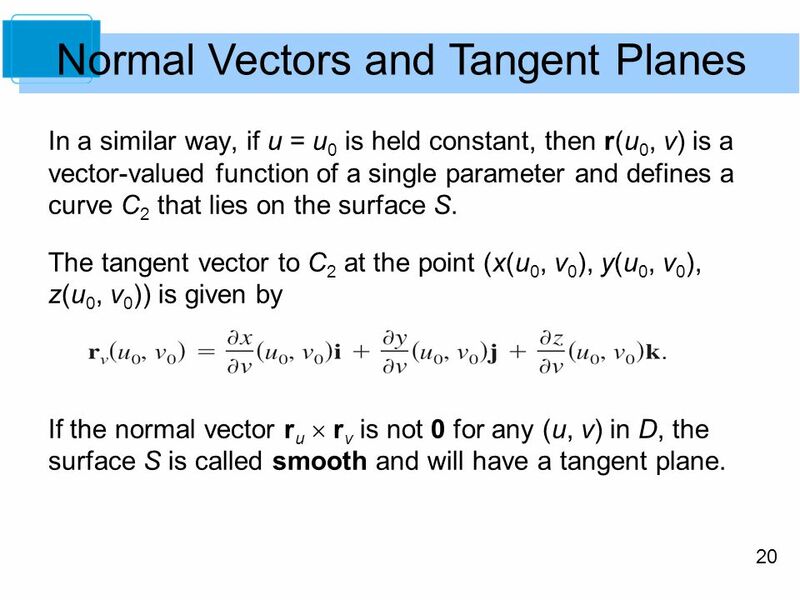 cont’d The normal vector is given by ru  rv = = –2ui – 2vj + k which implies that the normal vector at (1, 2, 5) is ru  rv = –2i – 4j + k. So, an equation of the tangent plane at (1, 2, 5) is –2(x – 1) – 4(y – 2) + (z – 5) = 0 –2x – 4y + z = –5. 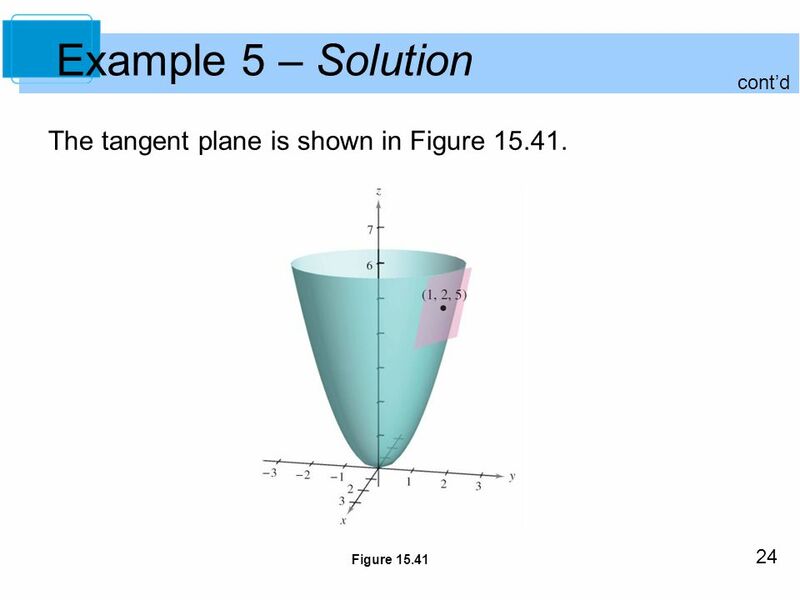 24 Example 5 – Solution The tangent plane is shown in Figure 15.41. In each Di let (ui, vi) be the point that is closest to the origin. 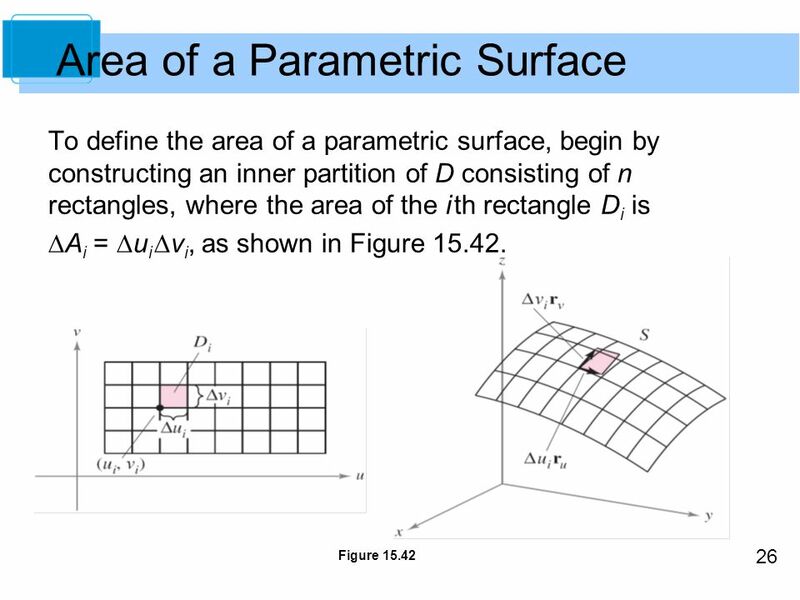 At the point (xi, yi, zi) = (x(ui, vi), y(ui, vi), z(ui, vi)) on the surface S, construct a tangent plane Ti . 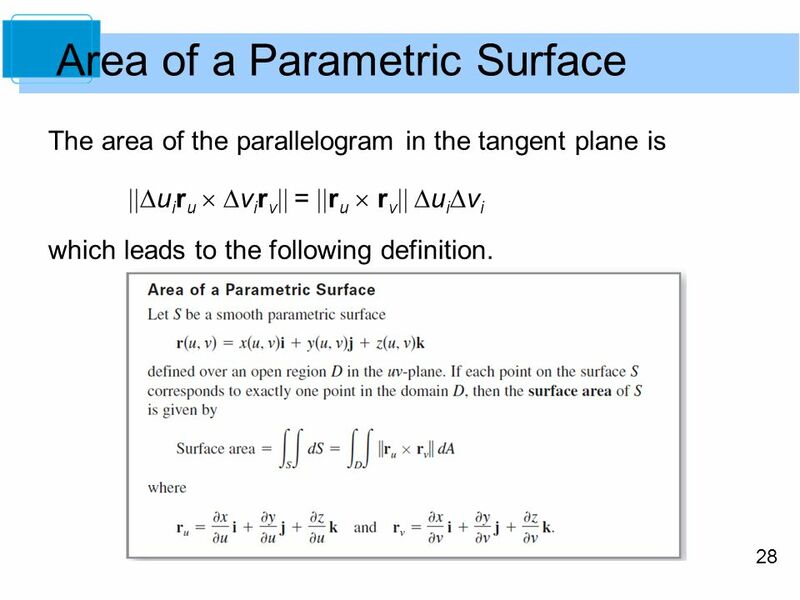 The area of the portion of S that corresponds to Di, ∆Ti, can be approximated by a parallelogram in the tangent plane. That is, ∆Ti  ∆Si. 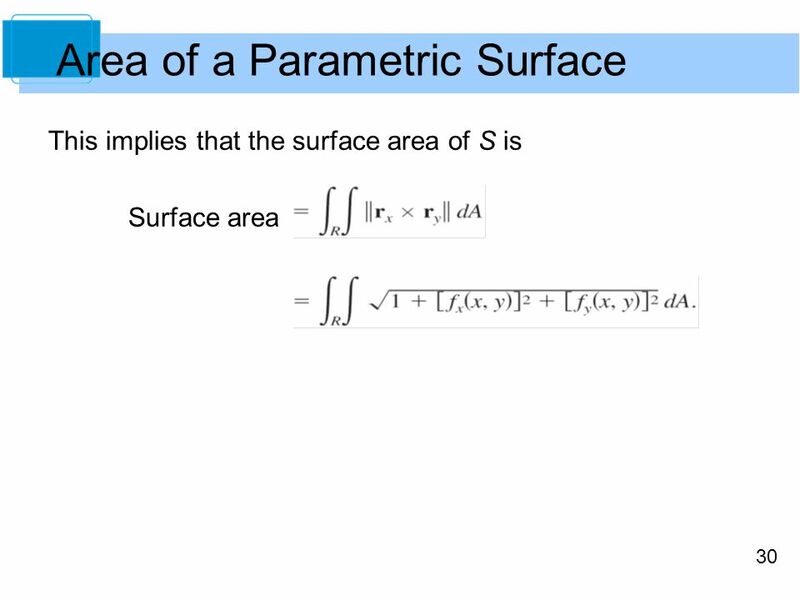 So, the surface of S is given by  ∆Si   ∆Ti. 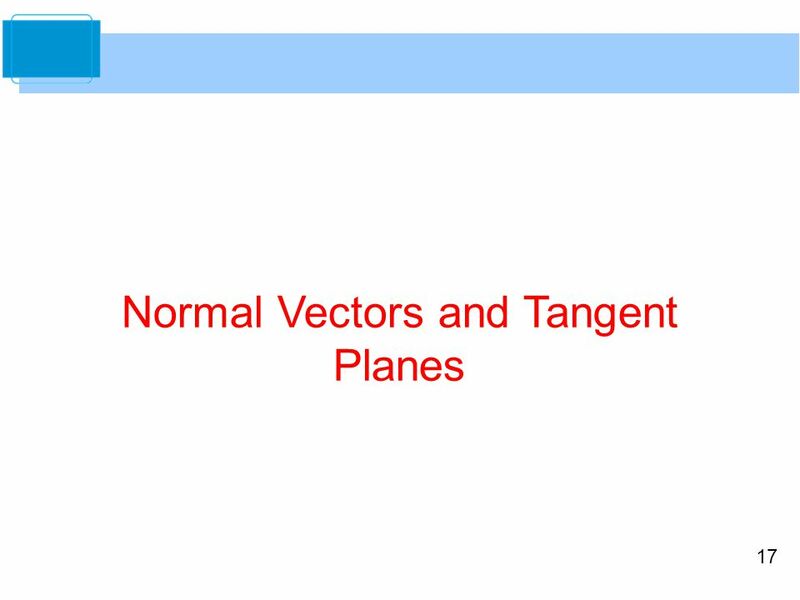 The area of the parallelogram in the tangent plane is ∆uiru  ∆virv = ru  rv ∆ui∆vi which leads to the following definition. Download ppt "Copyright © Cengage Learning. All rights reserved."